will be influenced by the ability of the farm to minimize production costs and produce adequate yields. opportunities to diversify into alternative crops are at the forefront of the farms’ long-term vision. 2017, he and Mary moved back to Kansas to live with family. The Flint Hills region of Kansas is a unique ecosystem in the heartland of the United States that is dominated agriculturally by cattle ranching and hay production. Attempts to diversify agricultural crop production here can be challenging due to the variable climate, rocky terrain, and calcareous soils. One alternative crop identified as having commercial potential is Lavender (Lavandula angustifolia and L. x intermedia) due to its drought tolerance, preference for high pH soils, and the local demand for lavender products. One particularly evident challenge facing lavender production is the need to reduce labor inputs (weed management, harvesting, planting, etc.). Additionally, variable precipitation and temperatures can reduce production potential. To address these issues while preserving natural resources, three production systems will be evaluated for four lavender varieties. These systems include: bare ground (cultivated), white landscape fabric, and black landscape fabric treatments. To assess the effectiveness of each system, measures of crop health, yield in addition to soil temperatures and moisture will be collected throughout the duration of the project. Labor hours will also be calculated in each treatment to assess potential labor reductions. Establish research plot using various commercially available lavender varieties and mulching treatments. Collect and summarize data on plant vigor, mortality, crop yields, soil temperature, soil moisture and labor usage for each treatment combination. Assess the effectiveness of each treatment, and develop hypotheses for observations made. Share the results of the project with other current and potential lavender growers via the United States Lavender Grower’s Association (USLGA), website and social media outlets, and at regional lavender grower via the United States Lavender Grower’s Association (USLGA), website and social media outlets, and at regional lavender grower meetings. The project treatments will include various measurements throughout the duration of the project. Data collection will be made from ‘plot plants’, located in the interior 2 rows of each bed (10 plants per treatment) to avoid artifacts from plot edges. -Yield- Lavender yield will be determined by quantifying the number of bundles produced from plot plants in each treatment x variety combination. Initial yield will be quantified in bundles (2” bundle diameter at stem base). Following drying of bundles, buds will be stripped, cleaned and weighed to determine total dried bud weight. -Soil Temperature- Soil temperatures will be collected by placing the temperature probes at rooting depth at mid-day on collection days. Aggregate readings will be averaged from three points in each treatment plot. -Soil Moisture- Soil moisture data will be collected by placing soil probes at rooting depth on sample collection days (see timeline). Following moisture readings, plots will be irrigated as needed. A presentation (with handouts displaying project results from the 1st year) was made at the fall 2018 USLGA region 6 growers meeting in Scott City, KS. 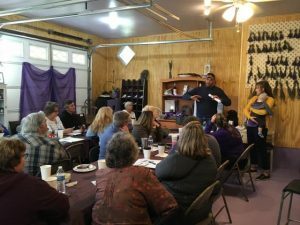 There were approximately 30 people (primarily lavender growers in the Great Plains region) in attendance. Many questions and stimulating discussion occurred during the presentation. An article was written in the USLGA newsletter, distributed to USLGA members quarterly. Originally this article was going to be published in the fall of 2018, but it ended up getting published later in the winter. Although it can’t accurately be quantified as to how many people read the newsletter, the USLGA contains over 500 members who would have received the newsletter. The articles main purpose was to summarize the project (background information, treatments, etc..). -Landscape fabric has the potential to reduce water usage for lavender, and in a dry year (such as in 2018), it can reduce substantial the level of irrigation needed by the establishing crop. -While we had record high temperatures in May, mortality from heat stress did not seem to adversely impact plants in the black fabric treatments. It was thought that the additional solar radiation absorbed by the fabric could kill the plants but we did not observe this, even through we experienced temperatures in the mid 90s. -The white fabric is not a practical option, primarily due to the fact that it did not reduce weed pressure, and even required more effort to keep weeds under control. A white fabric with black underlayer might make more sense, although the lack of adverse affects on the black fabric from heat would suggest this would be unnecessary. We have also learned from the installation of our plots, and will be better prepared to utilize fabric with this experience under our belts. It is absolutely critical that the fabric be covered on the edges, and the high wind environment makes extra securing measures worthwhile. The main disadvantage we have faced is the time required to implement the project, although it is likely that labor savings in the long run will be greatly beneficial to our operation.